After Steve and I checked out of our hotel, there were just two more stops to make on this fiftieth birthday friend fiesta, as my sister-in-law Tiffin calls it. 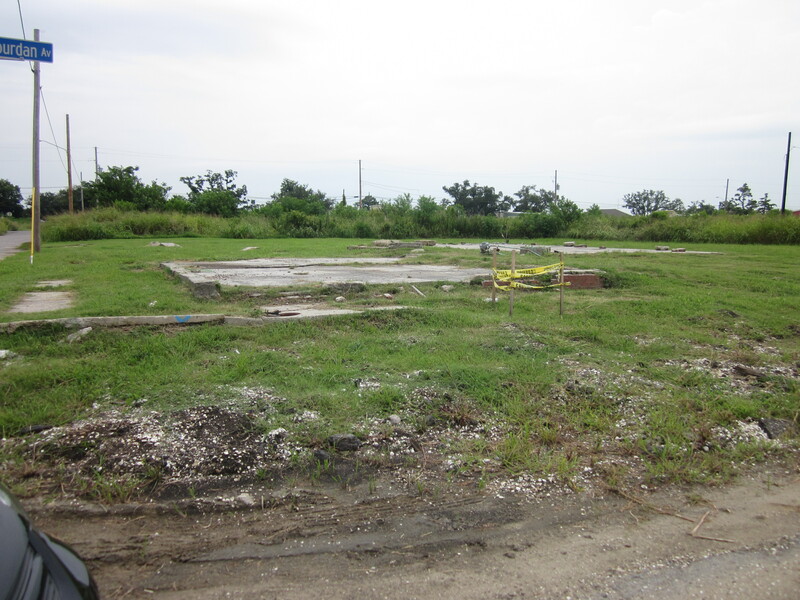 I looked up a bit of info on-line and got some directions, so we took our rental car and headed a few blocks east across the Industrial Canal to the Ninth Ward, made famous by Hurricane Katrina. The Industrial Canal is a shipping canal connecting the huge Lake Pontchartrain to the Mississippi River. The slide show above starts with three pictures of the new wall that has been built along the canal protecting the Lower Ninth Ward from the canal. The old one collapsed under the storm surge from the hurricane, sending a wall of water, fifteen feet high surging through this already devastatingly poor neighborhood obliterating the homes and killing 200 people. After the wall, you see the foundations of some of the homes that are now gone. After that you will see some of the homes that have been damaged, abandoned, or condemned. According to the Wikipedia article, some of those modern new homes are apparently a project of actor Brad Pitt. Notice the stilts and the solar panels. This area used to be plantation and farm land, a swamp, and a cypress grove. Dredging the canal provided economic opportunities and jobs. But it made the lower ninth vulnerable to flooding, which happened during Hurricane Betsy in 1965. Reminded me of the landfill we have in San Francisco that provides more buildable land…until we have an earthquake. Consider carefully when you mess with Mother Earth. It was a sobering tour, and I said a prayer for all the families who were so devastated. Next Post – From the Sobering to the Not-So Sober.